As much as I LOVE felt, I don't use it as often as I should. It's just one of those things I never think to add, so this was a great challenge for me! I love the look and texture of felt and love when I see projects using felt. I have a couple of projects today. The first one uses the Trim the Tree Die. I started by die cutting the tree base out of Chocolate Chip felt. I die cut the sections of the tree using Jade and Split Pea felt. I alternated the colors on the sections of the tree and adhered them to the tree base using FabriTac glue. I found FabriTac Michael's where the adhesives are and it is great for adhering felt. 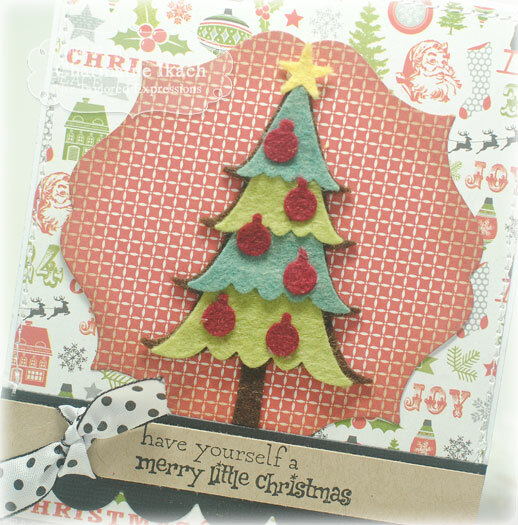 The ornaments on the tree were die cut using Cranberry felt and the star, Sunflower. The papers are from the 'Tis the Season Project Pantry. I also used the Label Stacklets 4 and the Medium Scallop Border dies on this project. The sentiment is from the Woodland Winter set. 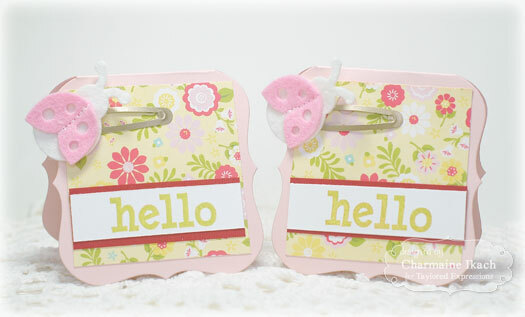 For my second project I created little placecards. First I had the idea to make little ladybugs out of felt using the Bugabee Bugs Dies. I used Cotton Candy and Marshmallow felt to create them. I stitched the body and wings together on my sewing machine. Once I decided to make the ladybugs into barretts, I hot glued them to the barretts and created these little place cards and clipped them to the placecard. The placecard was created using the Bracket Notecard Die. The papers are from the Sweet Girl Collection from Echo Park. 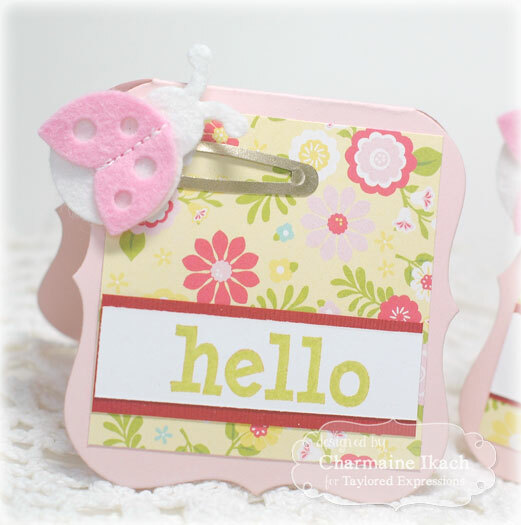 I stamped "hello" from the Bugabee set and adhered it across the placecard. 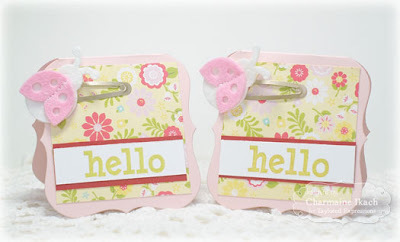 I thought these would make cute little favors at a little girls' party. I hope you've been inspired to create with felt!! Don't forget to visit the rest of the Baker's Dozen to see what they've created using felt!! Thanks for stopping by and have a great day!! 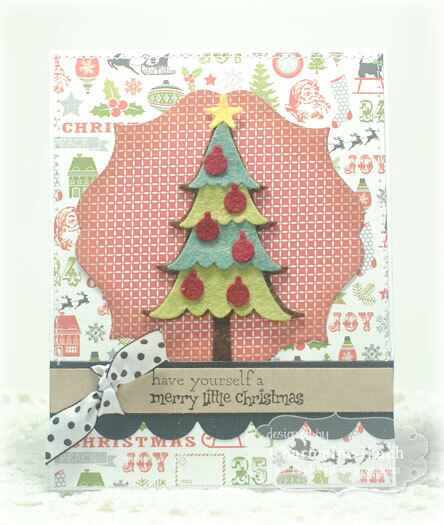 Your tree is just darling, and I LOVE the clips!!! What a fab idea, Charmaine! Wonderful, Charmaine! 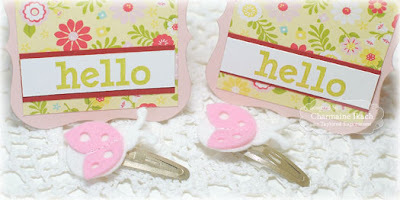 Love your felt tree and your placecards are darling - what sweet little barrettes! Awesome post Charmaine! 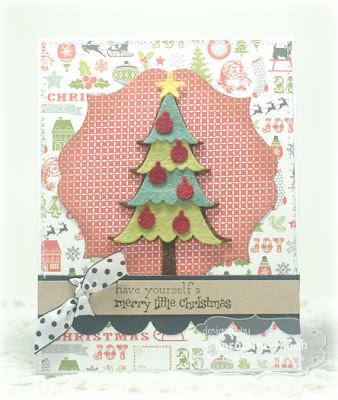 I adore that pink ladybug and your Christmas tree is a vision. So many great ideas!! I sooo love your Christmas tree with the red ornaments, Charmaine, and what a great idea to make the lady bug barrettes...they are just precious!!!! The Christmas tree is very cute and I just looovveee ladybugs!! Taylored Expressions October RELEASE DAY! !